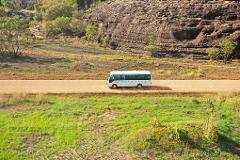 Our one day Arnhem Land tour departs Monday to Saturday from May 1st through to October 30th. 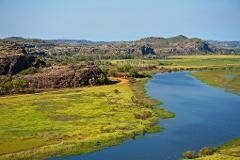 Today we visit Aboriginal Lands (Arnhem Land) access to this area is restricted to a select group of tour operators. 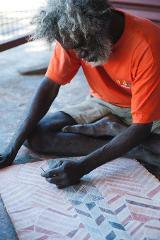 Visitors to Arnhem Land are able to experience a fascinating mixture of traditional and living culture. Arnhem Land is perhaps the one area in Australia where indigenous culture is still dominant, despite a long history of interaction with other cultures, for example the Macassens who visited the shores of Arnhem Land for more then five hundred years to harvest sea slug. They came by sailing boats from Indonesian Island of Sulawesi and left their legacy with the Aboriginal people. 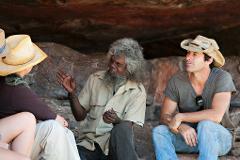 Then the Europeans, their impact on Aboriginal people was more far reaching and profound. Arnhem Land today has weathered all the storms and it has managed to stay as a last frontier and homeland of around 18.000 people. While we are in Arnhem Land a traditional Aboriginal guide will show you excellent examples of rock art on Injalak Hill (Long Tom Dreaming), this area has some of the best rock art examples in Western Arnhem Land and some say Australia. 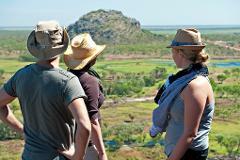 The view from the top of the hill is simply breathtaking, looking out across the floodplains and around the Arnhemland escarpment. 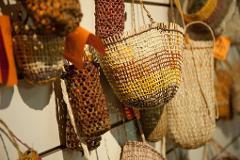 When we farewell our Aboriginal guide back at the Injalak Art & Craft Centre there is an opportunity to browse or purchase goods from this non-profit Aboriginal organisation. 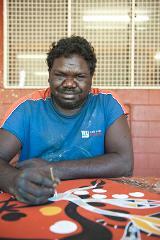 At the award winning Injalak Arts and Crafts Centre (Gunbalanya) there is time to watch the traditional Aboriginal people painting and to see the women weaving pandanus baskets. With its stunning scenery of billabongs, birds, escarpment this is truly a place where you can escape and experience this unique untouched haven of the Northern Territory. - A sense of adventure!